By in Uncategorised on 30th May 2015 . There has been a Civil War Monument on the Capitol Grounds for over 95 years, yet many people are unaware of its purpose or why it was put up. It was these questions which led David Smith to begin a quest to find out about the the monument’s history. David was born and raised in Pierre, SD, and after high school served 8 years in the United States Marine Corps, returning in 1992. Picture of the original dedication provided by the South Dakota Historical Society. David’s interest in the monument started while driving around Pierre in November of 2013 when he decided to visit the monument for the first time one evening. The simple monument, he observed was of a Civil War soldier. The only information at the monument site indicated it was erected in 1918 and dedicated to the Defenders of our Nation. As chance would have it, he had a meeting with the State Historical Society to discuss a document archiving project. After the meeting, he inquired where he could find additional information on the monument. Matthew Reitzel showed him a folder on the monument which included a photo from the original dedication on June 1, 1920 along with the original dedication transcript. Matthew and David used their shared interested in the monument to start a restoration project on what they found out to be was the first monument placed on the Capitol Grounds. They wanted its story and purpose to be an ongoing reminder to all generations of the sacrifices of war and the cost of freedom. They thought it was unfortunate that the original purpose for the monument had been forgotten over the years. As the project progressed, Matthew and David worked with the Governor’s Office and BOA to gain support and approval for the restoration project. The goal was to add walkways, benches, and lighting as an effort to connect the Civil War monument with the other war memorials on the Capitol complex. Thanks to the efforts of the Governor’s Office, State Historical Society, Office of State Engineers, Capitol Complex Restoration and Beautification Commission, Buildings and Grounds staff, David Smith, and Matthew Reitzel; the monument site has been improved and will be a focal point for visitors to the Capitol. David recommends you stop over and check it out since the monument has been restored to its place of honor on the Capital Grounds. David said they also plan to post the information they compiled on a local historical website that provides historical information on other sites around Pierre. In the near future, they plan to tie this site into an website permitting visitors to have access to historical information such as the original program transcript, history of the monument as well as other historical documents and pictures. The monument was erected through efforts by the veteran’s group called the Grand Army of the Republic (GAR). A number of the veterans of the Civil War came to the Dakota Territory to settle after the war and were part of the GAR. The GAR had a national organization as well as local groups. These groups met together at annual encampments in different cities in South Dakota to talk about patriotism, reminiscing about their time in service and remember those who had passed. They annually decorated the graves of the military on Decoration Day (which later became the national holiday we know as Memorial Day). They also assisted in establishing the State Soldiers’ Home in Hot Springs, SD. When they approached the State about building a monument, the State gave them $10,000 to complete their goal. The granite came from Vermont and it was carved in Nebraska. The monument was dedicated on June 1, 1920 with the GAR National Commander and Governor Norbeck participating in the ceremony. 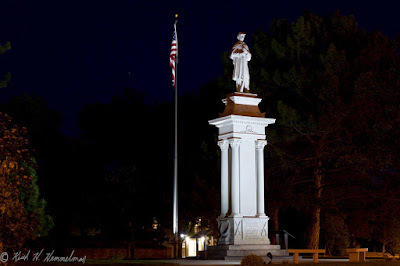 Picture provided by Keith Hemmelman of the updated monument. The Civil War Monument will be rededicated on Monday, June 1, 2015 at 11:00 am. The monument site is located on the triangle section of land south of the Governor’s Mansion. The plan is to reenact parts of the original dedication program. The Sons of Union Veterans of the Civil War dressed in period correct uniforms will conduct their official rededication ceremony as part of the program. Everyone is invited to attend.